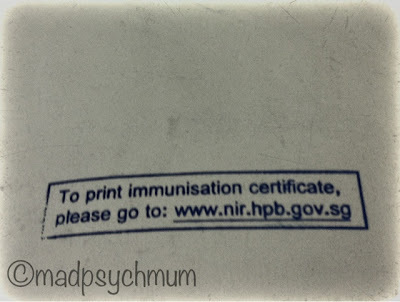 MadPsychMum | Singapore Parenting + Travel Blog: Oh, You Can Print the Vaccination Record Online? Oh, You Can Print the Vaccination Record Online? Just one of those things it would have been good to know before I made a trip to the polyclinic, parked our car and took a queue number. The child care centre told us that we needed to get the vaccination record from the clinic for registration purposes so we made our way there one Saturday morning. When I arrived, the nurse then informed me that I could print it online and promptly stamped my girl's health booklet. All you need is your IC number, Singpass password and child's identifying information (such as ID number). 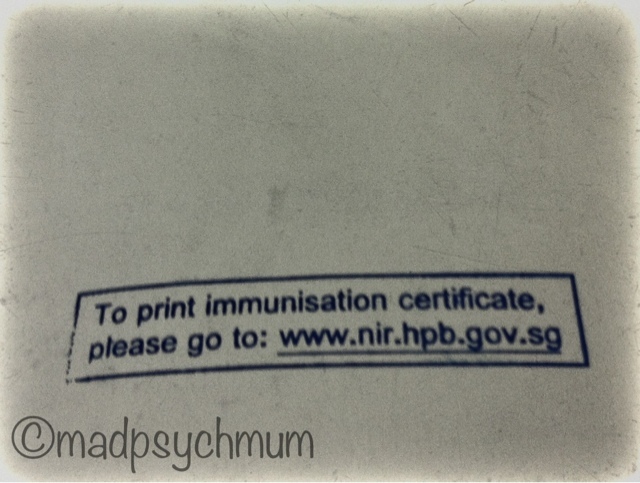 1) the polyclinic could have stamped it on our first visit so that we knew! 2) the child care centre should have also informed us! So anyway, it was a wasted trip after all and I thought I should let other parents know in case they are like me and don't. Although I'm quite sure your clinics/ child care centres should be more informative than ours.